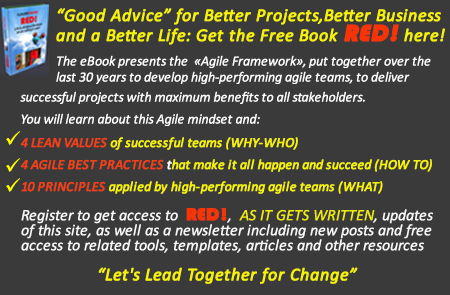 HOW TO use and leverage highly effective agile/lean, co-creative and collaborative project management best practices. HOW TO apply essential co-leadership values and principles to develop high performing, best in their field project teams and leaders. I can develop and deliver new on-demand customized programs to meet your specific needs for project-based training. These programs can include and integrate a mix of workshops and seminars of different duration adapted to the needs of your different audiences. To support your current and new in-house processes and best practices. To provide advanced training that will help you to introduce, promote, foster, develop and implement new best practices and high performing project team behaviors. What makes LTC™ training different? They are customized to meet your specific needs. They respect your current culture and values. They are designed as “FormActions” in which you internalize and experience new best practices and behaviors, simultaneously as you learn them. They cover BOTH the best agile and lean practices (Know How to Do) AND the associated collaborative behaviors (Know How to Be) that must be put in place to make those best practices effective. The experimentation of new tools and techniques via very effective mind-opening in-class team exercises. The use of new tools and techniques, during training sessions, on one of your own projects, individually or with members of your project team. The “coach-assisted” integration of the best practices on one of your own projects, in-between and after the formal in-class group training sessions. The simultaneous “coach-assisted” development and integration of the highly effective, agile collaborative behaviors and soft skills that are the fabric of all high performing successful teams. Each package will be customized for your specific needs and can be given in-house or in the location of your choice, in English or French. Coaching assistance is included and your cost per participant, will be well below the cost of public workshops. Your ROI on LTC™ Training Programs will be very high; the anticipated benefits will be felt quickly by your organization, stakeholders and team members, and by you – as a participant or sponsor. I go the distance for my clients. We can meet face to face if I am close by. If I am not, we can meet by telephone, by skype or video conferencing to discuss training, customization to meet your current needs, pricing and conditions.